Tipping screened compost into our greenhouse beds. 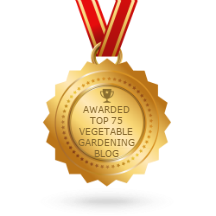 I recently posted on the Mother Earth News Organic Gardening Blog, encouraging people to make some of their own seedling compost by screening home-made compost. Here I will tell you more about ours. We have a very skilled compost maker who provides a plentiful supply of very good compost for our gardens. In the warmer months, compost piles work fast, and we build up a good stockpile. We set aside some time before cold weather, usually in early September, to screen the compost we will need for seedlings in the spring. Screening removes large particles which seedlings would struggle against. Because we use a large amount of compost, this job takes us days. It’s a job we fit in around more urgent tasks, over a period of weeks. We appreciate being self-sufficient in organic seedling and potting compost. It’s certainly nice to know what our plants are growing in, and not to have to lug bags of mix back from the store. We store the screened compost in our greenhouse, and so we have unfrozen compost ready to use when we need it in mid-January. Our greenhouse is designed mainly for spring seedling production. In summer it’s empty down to the concrete floor – we don’t grow anything there. 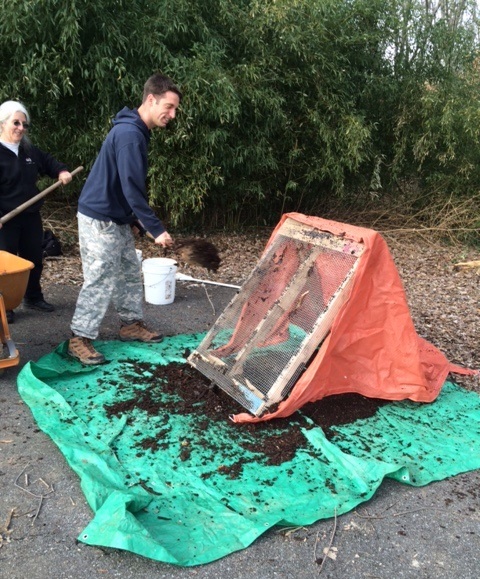 For extra value, we put the screened compost into our greenhouse beds and transplant lettuce into it in October. The watering that keeps the lettuce growing also helps the compost organisms to mellow out the compost over the winter. Worm eggs hatch, the lettuce roots make air channels throughout the bin, and we harvest the lettuce before we need to sow seedlings. 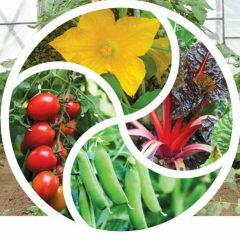 If you want to try this method, but you have a smaller operation, you can simply fill bins, tubs or boxes inside your greenhouse. Get them in position near the windows before you fill them. Our greenhouse beds are built of loose-fit cinder blocks, and we set up boards across the tops of the beds, all the way to the far end of the greenhouse. It’s a challenge to summon the courage to “run the boards”, but the worst that can happen is to tip the barrow or to fall 18″ off the boards! Compost screens come in two basic styles. We make flat compost frames that fit over a wheelbarrow, and screen into the barrows. 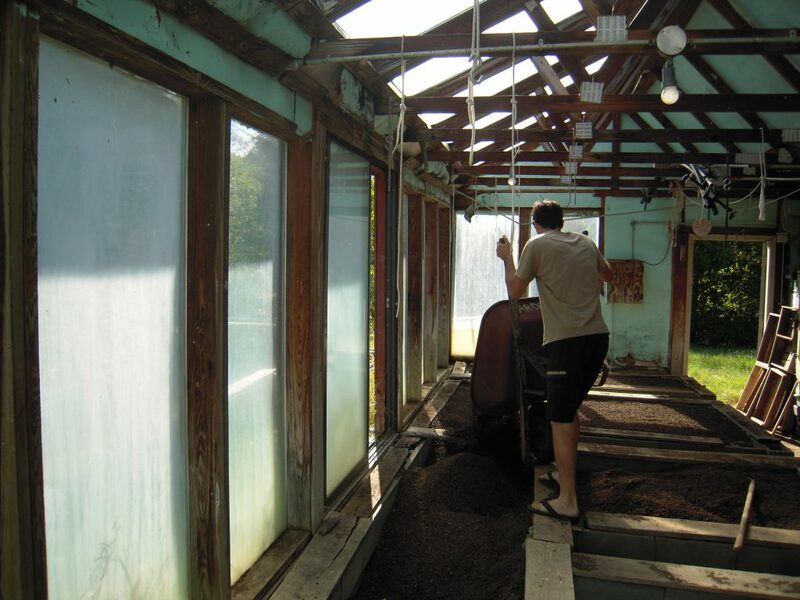 The other main approach is to use a free-standing frame and throw compost at it, so that it (more or less) screens itself. After that, you shovel the compost into a wheelbarrow. Each style has its advantages. Shoveling compost onto a flat screen. To make a flat screen, cut lengths of wood to make two frames that will sit on top of a wheelbarrow. Cut some rat wire (hardware cloth), sandwich it between the two frames and bolt the layers together. Then it will be easy to switch to new mesh when the old piece wears out. For a lighter, less durable model, make one frame and staple the hardware cloth to it. 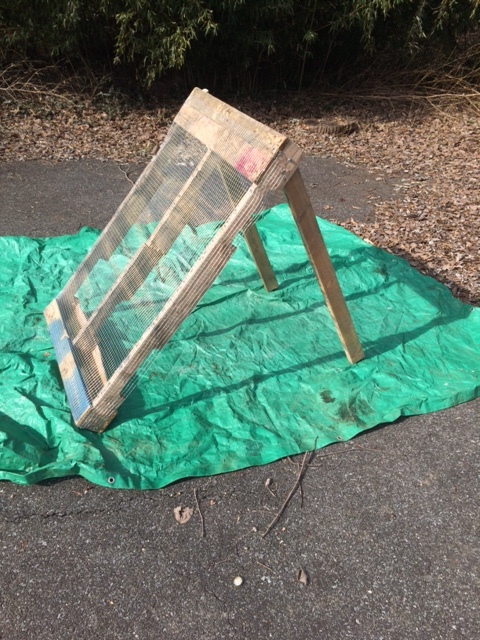 To make a free-standing compost frame, see the photos. Free-standing compost screen in use. A third alternative would be a flat compost screen suspended by ropes or chains attached to the corners from a swing-set frame or a convenient horizontal tree limb. 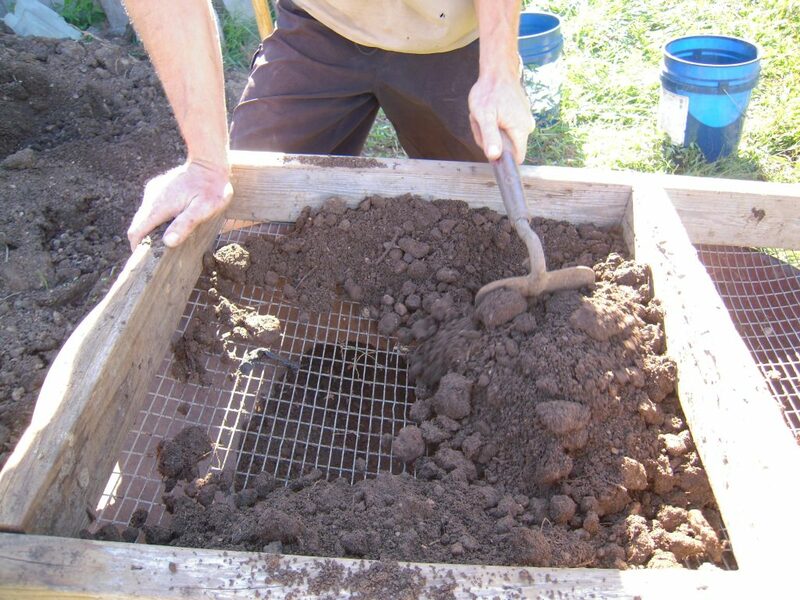 Put a tarp on the ground, or position a wheelbarrow under the frame, and shuffle the frame as archeologists do when sifting through soil looking for ancient artifacts. It is a definite advantage to arrange for the compost to land in a wheelbarrow, so it doesn’t need to be shoveled back up off the ground. We use the flat screens on wheelbarrows. We have a bucketful of special compost-screening tools, which are mostly regular hoe heads on short handles. These are easily made from broken hoes! Some people use the Korean Ho-Mi tool for this task. We also have an unusual yellow plastic ergonomic trowel designed for people with wrist problems. It’s excellent for this particular job! Any comfortable hand tool that will not destroy the wire is worth trying. 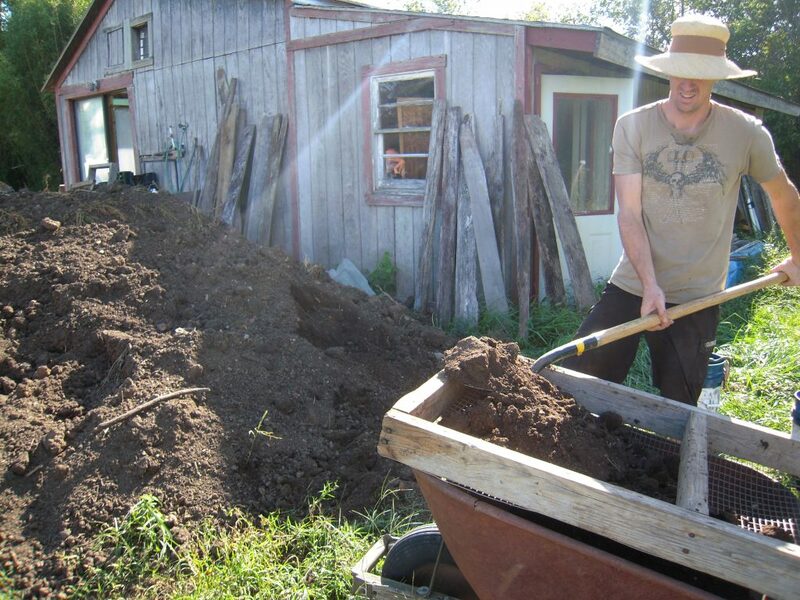 Using a flat compost screen on a wheelbarrow. We shovel a modest amount of compost onto the screen at one end, and use the tool to push the compost back and forth so that small particles fall through and bigger pieces stay on the screen. Try to minimize direct contact between the tool and the wire, by keeping the tool on top of the compost on the screen. It’s important to avoid scraping the compost back and forth, as the metal tools can break up the wire mesh quite quickly. When it seems like no more compost from that screenful will go through the screen, we deal with the leftovers. We collect rocks in buckets with holes in the bottom to let the rain drain out. 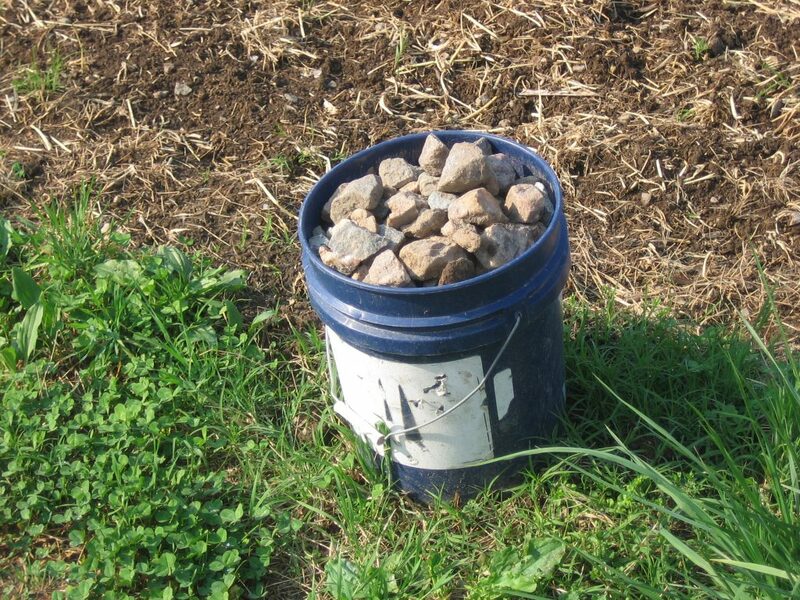 Our rock buckets can sit around for months collecting rocks, and we don’t want to incubate mosquitoes every time it rains! We use our rocks to fix holes in the roads. We use different holey buckets to collect up any woody materials or undigested compost materials, to go back around the compost process once more. Rocks are one of our biggest harvests. It helps to have fairly dry compost for screening. If it’s too wet, we abandon the task for that day, leaving some to dry on top of the screen, and turn to some other task. In very hot weather, we have even erected a canopy over our screening site, to provide shade and make the job more pleasant. When the greenhouse beds are full, we water the compost enough to keep it damp and alive. We transplant our greenhouse winter lettuce in early October (our first frost is mid-October), using cold-hardy leaf types or romaines. 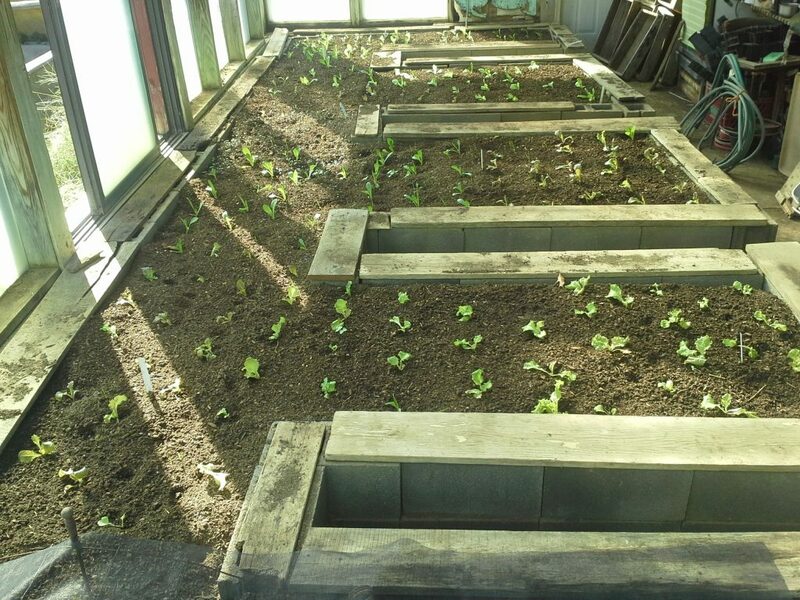 If you try this and are ready a long time before winter lettuce transplanting time, you could perhaps grow a different short-term crop in the compost first. We harvest outer leaves from the lettuce whenever they are big enough, all winter long. Then we start to clear them when we need to use the compost for spring seedlings. if numbers of aphids are really high, we use a soap spray.